In the Zen/Chan Buddhist tradition, there is an emphasis on cultivating and transmitting of Mind beyond forms. In the actual happening of such incidences, the knowledge/experience/realization of the teacher is transmitted directly to the student without the aid of words. Such was the attempt of the Buddha when asked by his prominent disciple Subhuti in this part of the Diamond Sutra. Subhuti asked, for those who make their intention to realize full enlightenment, how to subdue their mind? and where to abide? The Buddha replied, the mind should thus abide and be subdued. . However, Subhuti did not receive (the non-verbal transmission of the Mind), and followed up saying that he was ready to hear further (the teachings). In another occasion, in the beginning of another Buddha’s assembly, when everyone was waiting for, and anticipating the Buddha to start speaking, the Buddha raised his hand holding a lotus flower. Everyone was confused, but the first Patriarch of Zen/Chan Buddhism, Mahakasyapa, smile back to the Buddha. Such was the first incidence of Zen/Chan’s direct transmission of Mind. The Zen/Chan non-verbal transmission, therefore, represents the final stroke of awakening often after prolonged period of study, preparation, and practice. It is not to be imitated by beginning practitioners, nor can be it imitated successfully. There is so much truth words and teachings can convey, and beyond that, lies upon the blessings of oneself, the teacher and the universe. How do you approach food? Do you love it, or do you hate it? Some people like food so much that they develop strong attachment in eating, while others dislike food so much that they develop an aversion to eating. 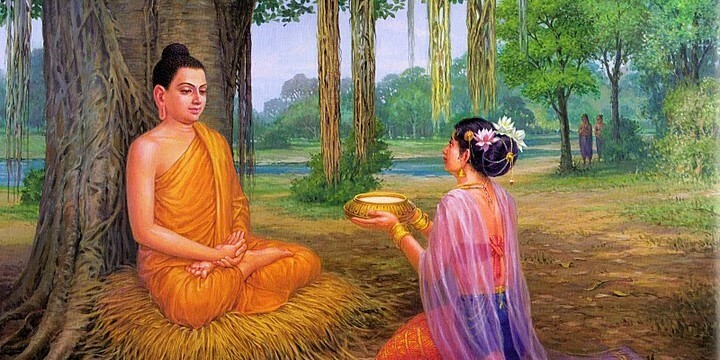 The Buddha himself suggested the middle way: After going through both extremes, as a prince and as an ascetic, He concluded that neither is the ultimate way, and resumed regular food intake after 6 years of ascetic practices. Borrowing and applying the famous Chinese cook Martin Yan’s famous phrase: If the Buddha can eat, so can we! Diamond is the most precious material on earth. Besides of its scarcity, diamond is also the hardest material on earth. Therefore it is adopted as the name of this Buddhist text. The full name of this text is: “金刚般若波罗密经”. 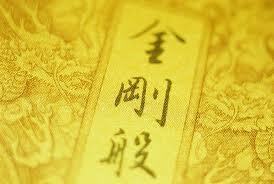 “金刚” means hard/impenetrable; “般若” means wisdom; “波罗密” means conducts leading to liberation; “经” means sutra/text. Together it means: The text on the impenetrable wisdom towards liberation and enlightenment. In the 6 core practices of Mahayana Buddhism (others 5 being charity, precepts, diligence, endurance, and concentration); wisdom is the last and perhaps the most important one. A clear and firm understanding and application of this impenetrable wisdom facilitates the practice of other 5, while the study and practice of other 5 does not necessarily results in arising of this wisdom. Therefore, in the foundation study of Chinese philosophy and spirituality, the Diamond Sutra is selected as a core text to be studied together with Daoist Daodejing and Confucius Analects. If reality is beyond the mind, how do we subdue it and where to abide afterwards? A Bodhisattva do so without attaching to self, personality, being, life, nor will a Bodhisattva attach to any descriptions, names, powers, missions, and states. For a Bodhisattva is a state, not something that can be attained by some “one”, the term “Bodhisattva” is only a name/description for such state. Therefore any “one” claiming its “self” as a Bodhisattva is not a real Bodhisattva. This Sutra, therefore, sweep away all false claims of enlightened states yet confirmed their realities. This sutra presents advance teachings that outline the intricacies of the pathway of a Bodhisattva. What are side tracks? 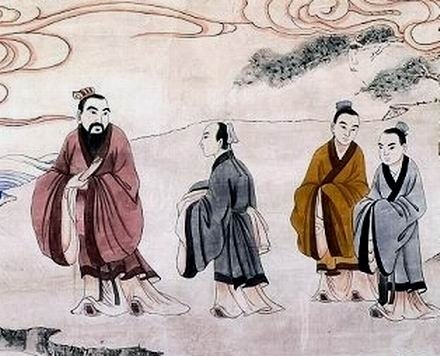 In Confucius Analects, side tracks refer to pathways that does not lead people directly to personal cultivation or social harmony. E.g. all technologies and skills such as farming, engineering, commerce, medical exploration, etc. Pursuing these skills are not bad, but they don’t necessarily make you a better person, and help one grows in spirit. For spiritual students, pursuing practices for the sake of mere curiosity and glamour can be dangerous, or in less severe case wasting time and energy. As the Analects described, while many practices can yield some effect in the short run, indulging one’s self in unknown practices can prevent or trap practitioners from making progress in the core spiritual path. In the Taoist tradition, Master Li Daochun had drawn together a comprehensive list describing different levels of side tracks (The Book of Balance and Harmony, Chapter 2). In the Buddhist tradition, the Buddha himself described the different levels of phenomena/tests one will face in advanced state of meditation (Shurangama Sutra, Chapter 9). These are very valuable references to serious spiritual students whose goal is self-transcendence and spiritual enlightenment. Side tracks are not to be afraid, they just need to be seen as what they are, then one can proceed safely through them. 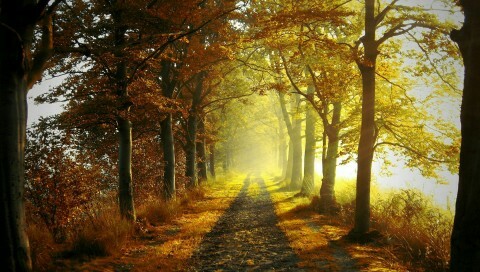 As enlightened master described: Straight and narrow is the path, waste no time.